Property 6: The villa of the Gulf Suite "I Benjamin"
Property 13: The villa of the gulf Dependance "Gli Ulivi"
Property 37: Bright and quiet appartment in an historical mansion with private garden. Property 46: Beautiful 2 floors Villa Private Pool and Sea View,6 bedrooms,WiFi,SEAFRONT! A Journey Through Real Sicily Starting From A Tiny Fisherman Village! 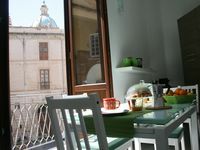 Property 48: A Journey Through Real Sicily Starting From A Tiny Fisherman Village! We stayed for a couple days at the end of March 2019. It was a very nice and comfortable apartment. It is in a good location a short walk from the sea. It is also not too far from all the sites. We walked to the touristy part of the city one day for fun, and the second day we took the free shuttle bus which is very close to the apartment. Francesca was very attentive and available if we needed help with anything (which we did not). She also provided us with a ride to the airport (best airport ever). Thank you for offering such a nice place to stay! Great location, wonderful host, apartment was exactly as we hoped! 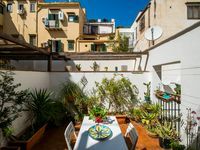 This was a lovely apartment in Palermo. Great location, the apartment was clean and more than enough amenities! Fabio who got me settled was incredibly friendly! He even put a cannoli and traditional Easter dessert in the refrigerator for me upon arrival. The building was very secure and I felt very safe as a solo female traveler. I would definitely stay here again!